You are here: Home / News / LeBron James absence brings about future concerns. LeBron James absence brings about future concerns. 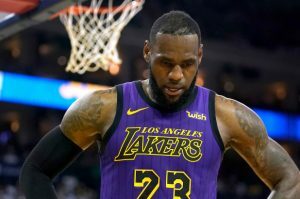 (ThyBlackMan.com) LeBron James has missed the most amount of games of his career: On Christmas Day in 2018, James suffered a groin injury and has watched a day-to-day diagnosis turn into a lengthy absence. In the 15 games the Los Angeles Lakers have played without James, they have accumulated a 5-10 record, and have dipped to the 9th spot in the Western Conference. With James, the Lakers were a respectable 4th seed in the Western Conference. It isn’t difficult to see the importance James has toward his team. But there is a trend with James and his absence: when he’s there, the offense and the team flows through him. The team wins games because he’s the one who leads them there. But whenever James isn’t there or injured then his teams usually falter. While some will state that this is the power of James as a basketball player, and the point would be valid, in the end, shouldn’t this mean that James should better equip an offensive system that better suits the team? A familiar argument comes when Michael Jordan’s retirement is mentioned. Jordan retired in 1993, and the Chicago Bulls still went to the NBA Playoffs and finished 55-27. In Jordan’s defense, the head coach was Phil Jackson and he employed a well-put-together system named The Triangle. Even in the absence of their greatest player, the Bulls still thrived. With systems, the pressure is taken off of the player and put into the accountability of the team. Even if a player is injured or benched, the team will thrive in their absence. It’s primarily why the Golden State Warriors and the New England Patriots play so well regardless of their circumstances. The roles within the team are well defined, and not relied upon one player. For James, this will mean relishing control. No longer will the team and their performances be predicated on his success. But the flipside is that his teams will learn to be self-sufficient, and other players can learn to play and develop an identity of their own. Another obstacle that James will have to face is whether or not he will let head coach Luke Walton attempt to right the ship. James has never been coached by a wunderkind of basketball before, and Walton is no different. He usually has dictated how the games will go and how the team is led. With the Lakers faltering without James, it may be important for James to allow Walton the luxury to attempt to right the ship. In the end, it will benefit James and the Lakers in the long run. Whether James makes changes or not, the Lakers are a better team with him on the floor. James has become one of the most revolutionary athletes in pro sports today. James impact as a star player is second to none within the NBA, and it’s pretty obvious that the Lakers miss his presence on the floor. But, life could be made easier for James and the Lakers. That is if James wants what is easy.